Richard Mullett is a lawyer and director of The Legal Partners, specialists in import and export law in the UK and Asia. Richard is passionate about facilitating growth for UK companies and has vast experience in advising and guiding UK companies through the process of setting up a company in China and Asia. Here he writes about the benefits of using an agent or a distributor to sell your product in an international market. For many UK businesses, selling abroad involves using agents and distributors. Knowing the difference between the two and which function is appropriate to your scenario is important. An agent is an intermediary you appoint to negotiate and, if required, conclude contracts with customers on your behalf so you have the contract with the customer. Agents are paid commission on the sales they make, usually on a percentage basis. A distributor is essentially an independent contractor. In distributor agreements, you sell your products or services to the distributor, who then sells them on to their customer, adding a margin to cover the distributor’s own costs and profit. The distributor has the contract with the customer. Always be clear about which arrangement is being used, as it is possible for a party to be both agent and distributor of different products or services under the same agreements (for example, a distributor can be selling products, such as computers to its customers but also as an agent supplying software for those computers). What are the benefits of appointing an agent? There a number of situations where an agency agreement may be preferable to a distributor agreement. If the business wants to retain greater control of the terms of sale of its products or services, in particular the price. Imposing resale price maintenance on a distributor is unlawful in most countries, but by selling through an agent the business can retain the freedom to safeguard its own prices for sale. If the business wants to restrict the agent’s freedom to choose the customers that they deal with. In most countries, there are restrictions on the extent to which a supplier can restrict a distributor’s choice of customer. However, by using an agent, a business retains the freedom to choose who to deal with and with whom the agent deals. Generally, fewer competition law issues arise with agent agreements than with distributor agreements. Where the business wants to retain direct contact with its customer. For example, where it offers bespoke design work or highly specialised after-sales service that can only be effectively provided by the business itself. In effect, the agent finds the customer and the business maintains the customer throughout the entire lifetime of the relationship. Where close control over marketing is important, such as where brand and image are crucial factors for the business or where the customer will only buy from an agent who has authorisation to use the manufacturer’s brand at point of sale. If the business wants to retain the financial risk of stock (consignment stock with an agent would normally remain theUK business’s property). So that, for example, in the event of the agent going into insolvency, the business still owns the stock. Typically, the commission paid to an agent is lower than the margin which a distributor will earn (since the distributor is taking a greater financial risk and investing in more operational resources). Appointing an agent will therefore, in general terms, probably cost the business less than a distributor. 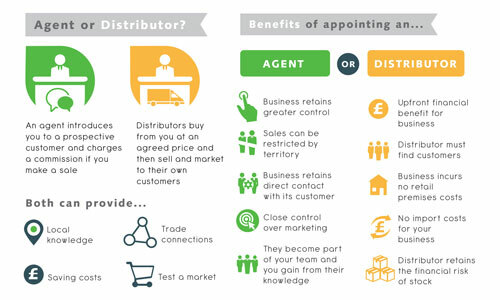 What are the benefits of appointing a distributor? The main benefit of a distributor over an agent is a financial one – the business sells the product or service to the distributor so a sale is made at that point in the accounts of the UK business. The distributor then has to find customers and on-sell the product or service. Another benefit of a distributor is that the business does not have to incur the costs of expensive retail premises to access consumer markets. Apple Premium Resellers, for example, are distributors incurring the premises costs directly. Similarly the distributor would be responsible for the importing of the product into its country of operation and also the warehousing, storage and transport arrangements for the products. Whether you appoint an agent or a distributor, there’s no doubt working with someone who knows your target market intimately will help increase your reach and, ultimately, determine your export success. Getting the best deal from your agent or distributor. This article explains what to negotiate in your contract with the agent or distributor. Bribery and corruption liability under the Bribery Act 2010 is one of the most important risks to assess and minimise when appointing agents or distributor. Failure to do so could lead to prosecution in the UK for the UK exporter and its directors. This article gives bribery act advice for UK exporters. An Anti-Bribery Toolkit will also help keep you and your business out of trouble. Finally, you might also find our Agents and Distributors Webinar useful. Richard, joined by John Reed from Export Aid, gives practical guidance and answers for all your concerns relating to hiring sales representatives when exporting.